I am Not a Clumper! A self-appointed expert once told me that there are two kinds of bamboo, clumpers and travelers. 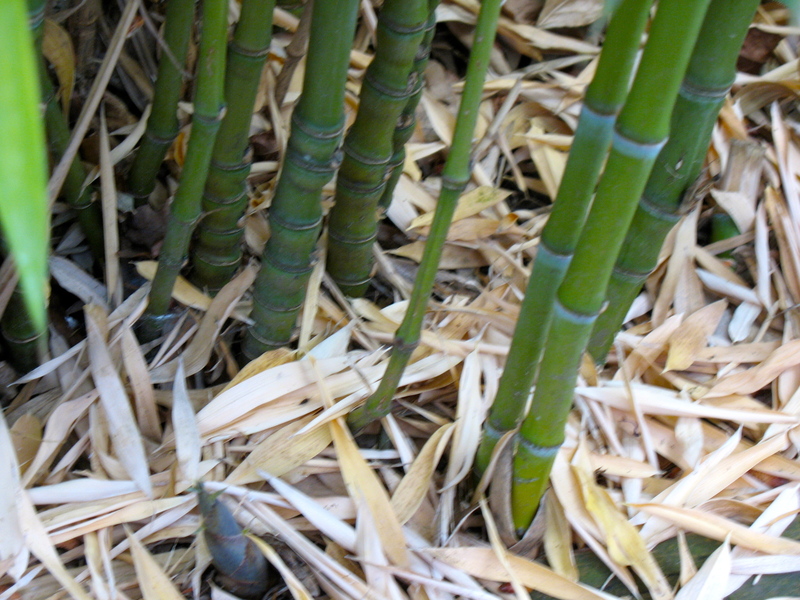 Clumpers, like the handsome black bamboo in one corner of our garden (above), are home- bodies. They are self-disciplined and like to stay in one place, hang out, feel familiar dirt around their roots, clatter in the wind and watch sparrows dart by. They appreciate a fine rain on occasion, and love being kissed by the sun, too. They are not risk takers, and do not like being uprooted, period. 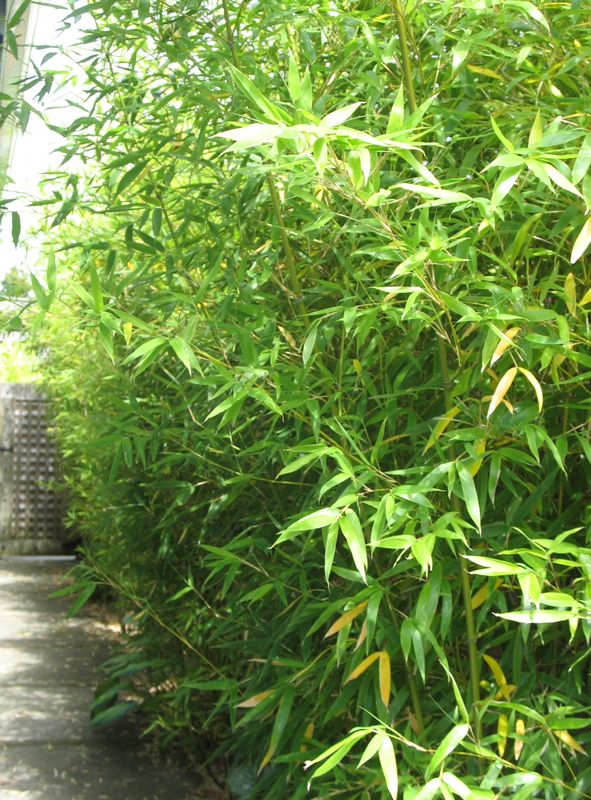 Travelers, like the golden bamboo creeping along our fence and into our neighbor’s yard (below), are rowdy, gangly as a stretched-out 13 year-old, and utterly lacking in self-discipline. They go where they want, unless you flood their huge root-feet with water, basically drowning them into submission. In the slightest breeze they roar like tweens in a middle school cafeteria. 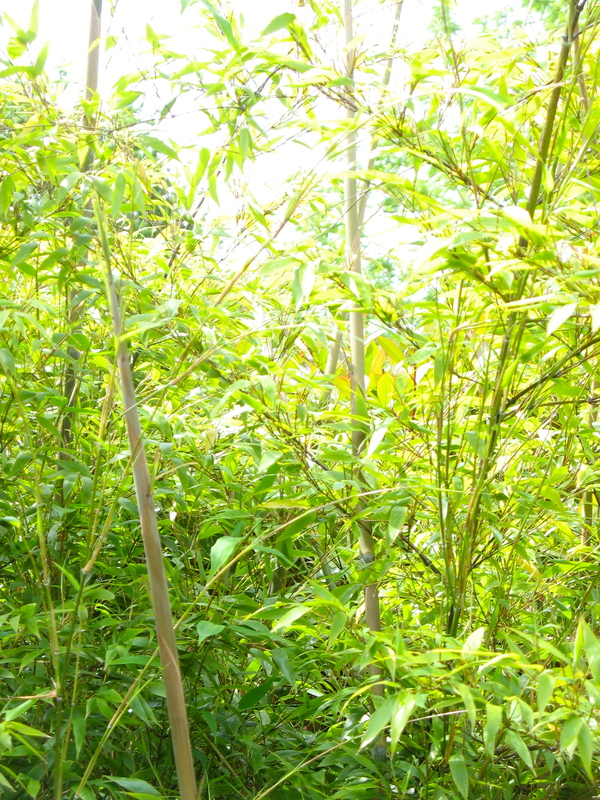 These green devils are responsible for bamboo’s bad reputation as wanderers, but they are so painfully attractive that people plant them anyway. If humans were bamboo, which would you be? I am definitely not a clumper, though I’ve tried hard to stay in one place. Oh, how I’ve tried! There are some advantages to staying put. Here in the Pacific Northwest, I know people who have lived in our little town for their entire lives. They’ve never even shopped in Canada, a 20 mile drive north. My clumper neighbors attended grade, middle and high school here, and since we’re a university town, they took care of that locally, too. These people work right here in town and shop at the same grocery stores as their moms. On weekends, birthdays and holidays they often have “family gatherings” in the backyard of the house in which they were born…same bar-b-qued salmon, potato salad, Budweiser, homemade marionberry cobbler…and they smile all the time. They are content. I’ve asked several to explain their strong attachment to only one place. “Why go anywhere else?” they ask. “It doesn’t get better than this, does it?” Good question. I’m sure it’s because my parents were travel junkies that I am, also, as are my children, as will be my grandson. Though born in Chicago, at seventeen months I was living in Stuttgart, Germany, toddling down the sidewalk in my tiny blue and red cotton dresses, our housekeeper, Ursula, screaming “Halt!” every time I got too close to the curb. My brother was born there one winter day, but it wasn’t enough of a connection to make us stay. After a few years, we moved to Maryland, where my father worked at Johns Hopkins and the humidity was so intense that all I remember is sitting in a blue plastic kiddie pool on the front lawn of our apartment complex sucking on root beer popsicles. It was good to leave that sweltering place. Next up, Detroit, where our pet rabbit, Thumper, was eaten by the collie next door, and my brother and I set fire to a refrigerator box while we were still inside. There was a huge flood that filled our basement right up to the top of the stairs and left a poopy stench when the water resided. My second brother was born in early September. We split that place soon after. When my dad developed Hodgkin’s disease, we moved to San Antonio where there were scorpions as large as tarantulas, and maybe tarantulas, too. It was the hottest place on earth, after Maryland, but the walls of the Alamo where we visited on weekends felt cool on our backs when we leaned against them. I heard Spanish for the first time in San Antonio. Soon, we moved to the San Fernando Valley in California, to be near my dad’s family. He died in the fall and I remember there were no colorful leaves blowing in the wind. There was no wind at all, and it was too hot for leaves to die, unlike my dad, I guess. There was a lot more Spanish floating in the air and it sounded like poetry to me, which I loved. Later, the waves at Malibu called and I learned to ride them and to love the ocean and to respect and maybe fear its power. After high school, G, my boyfriend, and I drove to Baja to surf and soak up sun. The heat felt like home, like a womb to us. We spoke Spanish by then and loved the stories of the fishermen and artists we met. We decided that Mexican cerveza tasted at least as good as Bud, especially if you added lime to it, and we developed a passion for chiles, and cinnamon churros, and became addicted to the sounds of roosters in the morning and donkeys braying all day. University in San Jose meant weekend concerts at the Fillmore in nearby San Francisco, fish and chips and sourdough bread on Fisherman’s Wharf, and the City Lights Bookstore where poets reading made me weep from sorrow and joy. The first time I heard Bob Dylan sing “Oh, Mama, is this really the end?” was in San Jose after a massive protest against the Vietnam War in front of the Administrative Building, where thousands of us were repeatedly tear gassed. G and I were married in our junior year and celebrated by studying abroad in Florence, Italy. He spoke Italian by then, and I still only spoke Spanish, which every Florentine seemed to understand. Living in Italy was like not waking up from a beautiful dream. The language was an opera, compared to the sweet song of Mexican Spanish. The pastas and vinos were to die for. What was most impressive were the ancient ruins of places like Rome, and Herculaneum, the city destroyed by Mt. Vesuvius. There was art everywhere, lagoons in the south, and towns with so many domes and towers, in Tuscany, that they blocked the sky. As you can already see, this lady is no clumper. Since Italy, wanderlust has driven me to London, Greece, the former Yugoslavia, Austria, back to Germany, through France, several times to Spain, almost yearly to Mexico, twice to New Zealand, three times to Taiwan, constantly to Canada and a handful of times to Alaska and other states. Am I exhausted? Not even close…okay, maybe a little. Do I regret being a traveler and not a clumper? Only when holidays and birthdays roll around and my children, both big-time travelers, are Skype-able, but not huggable because they’re in Taiwan or Prague or wherever their inherited passion for a non-clumping life leads them. Is it really as good as it gets right here in our Pacific Northwest town? I’m guessing, yes. But go ask a clumper, unless you’re one yourself, in which case you already know. You have a voice for memoir—sweet and unpretentious, informative and analytical–poetic and precise—really enjoyed reading this–and learning, and being transported. Thank you. Thanks, jd. You are most generous. Sweetheart (fellow non-clumper), this story reads like a poem. So much rythym and so many images. Magical….really! !